Instructions: My card is 5 X 7". Make card base and cover with a piece of the paper collection. I also covered the inside of the card with the same paper but you could use a coordinating color of the paper. Use the Eyelet Border Basic Die and cut a wavy edge down the 7" side of the card front. Take a piece of white cardstock and using the Eyelet Border Basic Die and the Fleur Border Basics Die and cut a scalloped piece to glue down the front of the card base. Once this piece is glued down, glitter the white edge of the card front and set aside to dry. Using Jet Black Archival Ink stamp the frame and using the coordinating die cut it out. Color the frame using the marker and color the leaves and buds with the Dove Blender Pen and inks. Use the dimensional tape to pop up the frame a bit from the card front to give it more dimension. Now set the card aside while we work on the flowers. Stamp the flowers with Archival Deep Purple and Memento Lulu Lavender inks. Color them with the same colors of inks. Next run the flower petals through the mold and the Vagabond 2 and then set aside to dry. 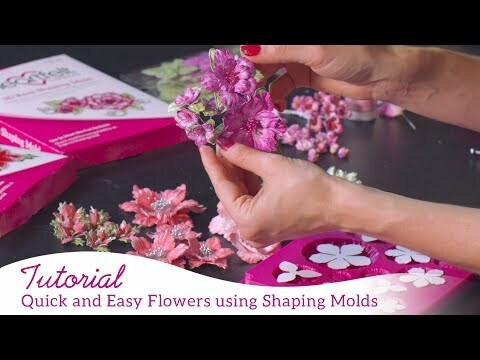 Glue Prills to the center of the flowers and then glitter the edges and set aside to dry. Once the flowers are dry glue them to the frame on the front of the card.